Our co-founder Sid Stevens says there is no such thing as a bad day: some days are just better than others. Fortunately, Sun Youth is able to count on a group of extraordinary people who are sure to turn a frown upside down when you’re not having a good day. These individuals with intellectual disabilities have been part of our landscape for the last 20 years. In all, approximately 40 persons sort the clothing, toys and footwear received as donations, which are then distributed to families in need. They prepare and distribute food baskets while others perform various office-related tasks according to their skills. Monday to Friday, they are busy doing their jobs. Some are accompanied by counsellors from a readaptation center (CRDITED Montréal or West Montreal Readaptation Centre). 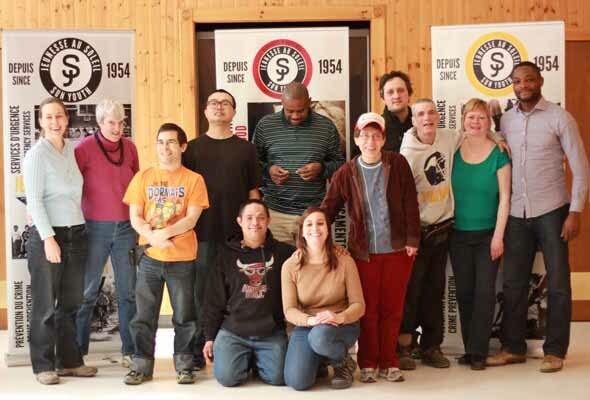 Others are either on work-training to complete their schooling, volunteers or employed by Sun Youth. Wherever these workers are from, their contribution to our organization is significant in many ways. In addition to all the hard work they do, they brighten our days and their laughter reminds us that our problems are small when put into perspective. Be the first to comment on "Here at Sun Youth: Laughter keeps us going"